THE Government will revive the women-in-mining initiative as part of a programme to continue empowering women in Zambia, President Edgar Lungu has said. The President said women had shown potential in mining entrepreneurship in the past and it was important this was exploited to ensure they were able to contribute to Zambia’s economic development. 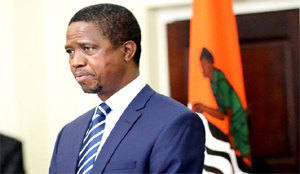 Mr Lungu said this yesterday when he met a delegation of the United Nations (UN) Women Movement for Gender Equality led by executive director Phumizile Mlambo-Ngcuka on the sidelines of the just-ended African Union Heads of State Summit in South Africa. He said in pursuing women empowerment as prescribed by the theme of the AU, Zambia had already made headway in various aspects of Government to ensure women got the required support in enterprise. Although women had shown great capacity in mining in the past, this was currently not the case as most of them failed to sustain their activities due to lack of support and funding. “It is all about galvanising their activities and now that we are in power, we shall ensure they succeed. With your help as an organisation, the women will begin to do well again,” he said. The President said he was keen on Government doing everything possible to ensure women’s prosperity as this guaranteed prosperity in homes and the nation at large. He said at household level, families were being encouraged to support the girl-child and making her realise her potential in all endeavours without ascribing roles that limited their positive achievements. Women themselves should also be in the forefront to support each other and celebrate each other’s success. Mr Lungu said although Zambia was making strides in women empowerment, there were still areas in which organs such as the UN that women could help to improve. Dr Mlambo-Ngcuka asked the President to sign up for the ‘HeForShe’ campaign, which stood up for gender equality and targeted men that were gender sensitive. Zambia and President Lungu’s efforts in ending child marriages in the country make him an ideal candidate to sign up and speak for the campaign. Zambia only has 41 people signed up for the campaign, which has the likes of United States President Barack Obama as members. “We wanted to meet you and make you aware of the interest that we have to work with you particularly in supporting the work in ending child marriages,” she said. Dr Mlambo-Ngcuka said the UN also wanted to implement programmes that linked women empowerment with natural resources. It was why there was an emphasis in supporting women in the extractive industry so that they could achieve economic independence and contribute to national growth. “We currently support women in mining in African countries and we are looking forward to working with women in Zambia,” she said.